Vitamin C has a rich and surprisingly controversial history. On the one hand, science is clear that the body needs it, but the type, dose, and frequency are all up for debate. When the common cold is making the rounds, many people turn to vitamin C, also known as ascorbic acid, to help ward off illness. Without it, immune system function declines. Studies also show that without adequate vitamin C the lining of blood vessels and membranes of cells deteriorate. It is a big deal! But, before downing a lot of prepackaged packets of vitamin C (probably with artificial colors and sweeteners), it is important to understand which forms of are most effective and how to safely consume it. Vitamin C is a water-soluble vitamin that is needed for many reactions within the body. Humans are not capable of making it internally (most other animals can manufacture it in their livers). Vitamin C is present in many foods, especially brightly colored vegetables like bell peppers and citrus fruits, among others. Since the human body does not manufacture or store vitamin C, it must be obtained regularly from diet (or supplements). Though low level vitamin C deficiency is common, severe deficiency (also known as scurvy) is rare in modern times. Vitamin C is a powerful antioxidant, meaning it can help protect the body from the damage of free radicals. On a practical level, this means that it protects cellular health, reduces the effects of aging, and boosts the immune system. 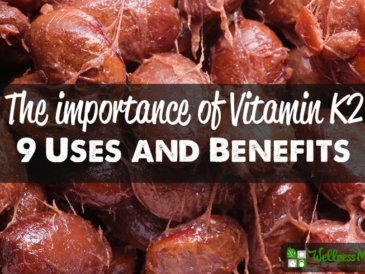 I first learned about the benefits of vitamin C in high school when I had to do a research paper on Dr. Linus Pauling, a Nobel Prize-winning chemist who is considered one of the fathers of biochemistry. He spent much of his career studying vitamin C and even wrote several books on the vitamin’s impact on health. His work provided much of the current understanding of this important vitamin. Now, things are going to get hairy. The answer is that it depends on who you ask and when. Modern research is divided and every health expert seems to have a different opinion. Like many aspects of health, the answer is likely that it depends and that it is different for every individual. For many healthy people, it is likely possible to get enough vitamin C from rich food sources like certain fruits and vegetables. Certain supplements also contain just whole-food sources of vitamin C and can be beneficial for those wanting to slightly increase their vitamin C consumption. Research shows that those with certain conditions may benefit from supplemental vitamin C as well, sometimes even in the form of an IV. In fact, some doctors are experimenting with high-dose IV dosing to help in recovery from serious illnesses, surgery, and even cancer. Linus Pauling himself was rumored to take 12,000 mg or more of vitamin C a day (and he lived to 93)! Since up to a third of people are deficient in vitamin C, it can be important to supplement, but the type absolutely matters! See what I personally do at the bottom of this post, but do your own research and talk to your own doctor to see what is best for you. Perhaps the most well known benefit, and with good reason. Administering extra vitamin C is always part of my cold and flu protocol. Interestingly, this is also one of the more hotly debated benefits. Several reviews of all randomized controlled data showed little or no effect on colds from vitamin C supplementation. Most of these studies looked at small doses or at the effect after the onset of colds. Other studies showed benefit from larger doses and from taking vitamin C before the onset of illness. Most notably, one study showed a reduction in symptoms and duration of a cold from one 8 gram dose of ascorbic acid on the first day of symptoms. (Fair warning, a dose that big will likely reach “bowel tolerance” and mean diarrhea for a few hours). What I do: I start each day with the juice of one lemon in water, which yields about 30 mg vitamin C. I take a food-based vitamin C supplement daily. I also take bigger doses of ascorbic acid during times of stress or illness … more on that below. A lesser known but equally important benefit of vitamin C (and why it is part of my daily routine). 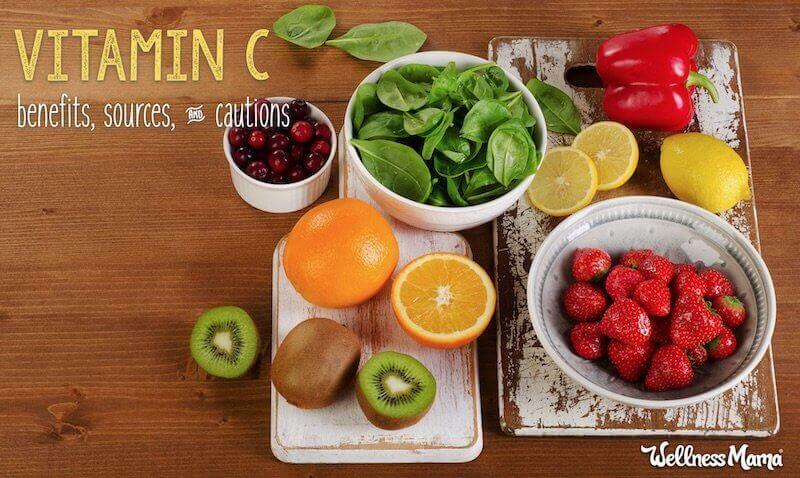 The brain maintains vitamin C levels even with other parts of the body show signs of deficiency. In fact, the brain often has 100x concentration as the rest of the body and likely for good reason! As you are probably already aware, free radicals and oxidative damage are bad news. Vitamin C is a potent antioxidant that correlates with reduced risk of disease and longer lifespan, likely because of its ability to reduce oxidative damage and free radicals. Specifically, studies have found that vitamin C is especially effective at reducing damage in the lungs. This is why RDA guidelines recommend higher vitamin C intake for smokers. Ascorbic acid is also sometimes used in conjunction with cancer treatments to help mitigate oxidative damage. For those of us who (hopefully) don’t smoke or have cancer, a diet rich in vitamin C and some occasional supplements will likely just help keep inflammation at bay. Studies link severe deficiency of vitamin C to emotional instability and anxiety. In one study adequate consumption led to a 35% reduction in mood disturbances and increased oxytocin. Yet another study found an increase in libido from 3,000 mg a day supplementation. Yet another reason to start the day with lemon water! The jury is still out on this one, but some studies show that diets high in vitamin C seem to reduce the chance of heart disease and stroke. This is logical, since vitamin C is naturally found in fruits and vegetables and consuming enough of these is also great for the heart. Another study showed that vitamin C may increase HDL cholesterol and reduce small particle LDL. The latest research even shows that this vitamin may reduce arterial plaque and strengthen blood vessels. Internal and topical vitamin C can help increase collagen production and improve skin health. 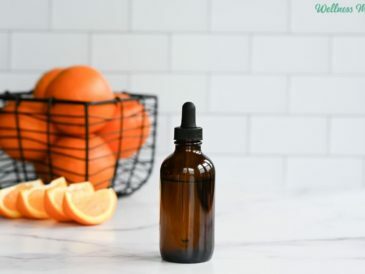 Vitamin C helps stabilize collagen and improves the connective tissue in the entire body, including the skin and bones. 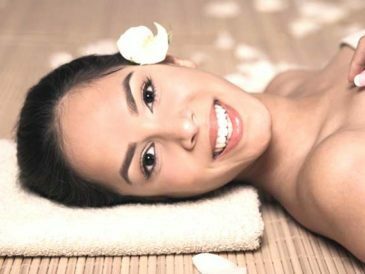 It is widely used in beauty products since it induces collagen synthesis. Studies even show that it may slow the natural aging process by protecting and improving the body’s collagen. Topical treatments are clinically shown to reduce the appearance of wrinkles, lines, and sun spots. I often mix a little ascorbic acid powder into my face wash to get these benefits. I also make this facial serum for additional skin benefits. I also increase my intake of “C” when I’m stressed because it is directly used by the adrenals. 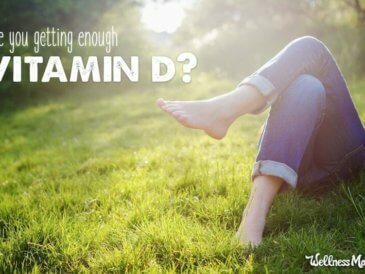 Though this tidbit is less well known, vitamin C is necessary for healthy levels of cortisol. It is found in high concentrations in the adrenal glands and can become rapidly depleted during times of stress. Vitamin C is naturally found in many foods, and when possible, this is the best and safest way to consume it. As I’ve said before, you can’t out supplement a bad diet, so even if supplements are needed, diet must come first. A note on vitamin C and when to consume/take it: vitamin C also helps the absorption of iron, so I try to take it with meals where I eat a real food source of iron. To get vitamin C from food, consume plenty of raw vegetables and fruits like brightly colored bell peppers, citrus fruits, acerola cherry, broccoli, cauliflower, and others. This is just good advice in general but also great for ensuring healthy levels of vitamin C.
As I mentioned, my regular go-to is drinking lemon water each morning. Even with the best of diets, getting adequate vitamin C from food can sometimes be difficult or not possible. In fact, it’s one of only five supplements that Chris Kresser recommends supplementing with since it can be so hard to obtain from food. Unfortunately, heating destroys much of the vitamin content in food, so unless a person is consuming a wide variety of raw brightly colored fruits and vegetables daily (which is difficult in the winter months), supplementation can sometimes be helpful. 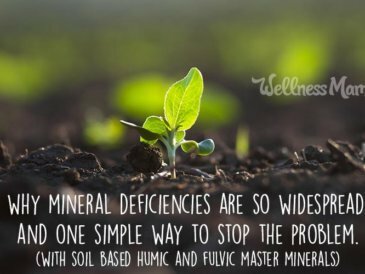 Studies have also shown that the nutrients in food have declined over the last 50 years, and this includes vitamin C.
I take a food-based C supplement daily because it is a relatively small dose and makes up for nutrients that aren’t present in food anymore. My favorite is this Essential C Complex. The least expensive and most-studied type of vitamin C is ascorbic acid powder. I keep a big bag of non-GMO ascorbic acid around for use at the first sign of illness but don’t take it daily. 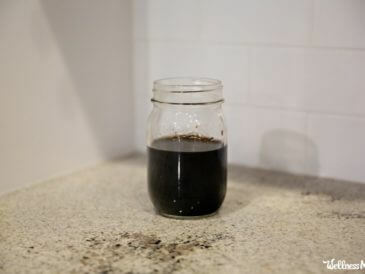 I also mix ascorbic acid into one-time use skin applications like face masks and into my daily cleanser. It loses its effectiveness quickly when mixed with liquid so it doesn’t work as well for topical uses when pre-mixed into big batches. This form uses a specialized technology that is said to make it more bioavailable and much less acidic. My kids love the taste of this one and take it willingly so I always keep it around. It also has great reviews for skin health and I’ve been experimenting with making it part of my daily routine along with a liposomal turmeric. This essential vitamin is water soluble and generally considered safe at doses up to 2,000 mg a day, according to the Mayo Clinic. At doses larger than that, it can potentially be problematic. Diarrhea is the most common side effect. At extremely large doses, vitamin C may also carry the risk of increasing the likelihood of kidney disease. Pregnant women should also not take doses above the recommended daily amount as it may cause problems for baby. What do you think about vitamin C? Do you take it or try to obtain it from food? Douglas RM, Hemilä H. Vitamin C for preventing and treating the common cold. PLoS Med. 2005;2(6):e168. Hansen, Stine Normann, Pernille Tveden-Nyborg, and Jens Lykkesfeldt. “Does Vitamin C Deficiency Affect Cognitive Development and Function?” Nutrients 6.9 (2014): 3818–3846. PMC. Web. 29 Mar. 2018. Zandi PP, Anthony JC, Khachaturian AS, et al. Reduced Risk of Alzheimer Disease in Users of Antioxidant Vitamin SupplementsThe Cache County Study. Arch Neurol. 2004;61(1):82–88. Douglas RM, Hemilä H (2005) Vitamin C for Preventing and Treating the Common Cold. PLoS Med 2(6): e168. 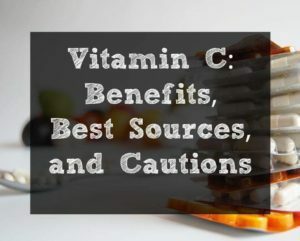 Sebastian J. Padayatty, Arie Katz, Yaohui Wang, Peter Eck, Oran Kwon, Je-Hyuk Lee, Shenglin Chen, Christopher Corpe, Anand Dutta, Sudhir K Dutta & Mark Levine (2013) Vitamin C as an Antioxidant: Evaluation of Its Role in Disease Prevention, Journal of the American College of Nutrition. Suh, Sang-Yeon et al. “Intravenous Vitamin C Administration Reduces Fatigue in Office Workers: A Double-Blind Randomized Controlled Trial.” Nutrition Journal 11 (2012): 7. PMC. Aguirre, Rene, and James M. May. “Inflammation in the Vascular Bed: Importance of Vitamin C.” Pharmacology & therapeutics 119.1 (2008): 96–103. PMC. Crisan, Diana et al. “The Role of Vitamin C in Pushing Back the Boundaries of Skin Aging: An Ultrasonographic Approach.” Clinical, Cosmetic and Investigational Dermatology 8 (2015): 463–470. PMC. Carr, Anitra C., and Margreet C. M. Vissers. “Synthetic or Food-Derived Vitamin C—Are They Equally Bioavailable?” Nutrients 5.11 (2013): 4284–4304. PMC.